Welcome to Went North Bed and Corral. We are an adult facility with two cabins available for rental. We cater to horse trail riders who want to relax after their ride in a comfortable cabin setting with the amenities of home. Tami worked as a veterinary technician for 30 years, specializing in equine services for the majority of her career. This experience makes animal health and safety one of her top priorities. Each cabin site offers safe, relaxing paddock areas for up to 6 horses with shelter options depending on weather conditions. You need to supply hay and grain for your horse. We ask that you leave the horse areas in the condition that you found them. There are wheel barrows and pitch forks available. Our two cabins will accommodate 4-6 adults. They have fully furnished kitchens and a BBQ grill available (charcoal is not provided). One cabin has a combination of queen, double, twin bed arrangements in 3 bedrooms while the other cabin has 2 bedrooms with 3 twin beds in each room (bedding and towels are provided). Both of the cabins have one bathroom with shower for all guests. The locations are private so guests can take it easy after a ride in the cozy living areas complete with television, DVD, and stereo or just sit around a campfire. Many of our guests return each year with the feeling of coming home. The option of renting both cabins for larger groups is available. Our cabins are situated next to the Huntersville State Forest, which has over 16,000 acres of land. 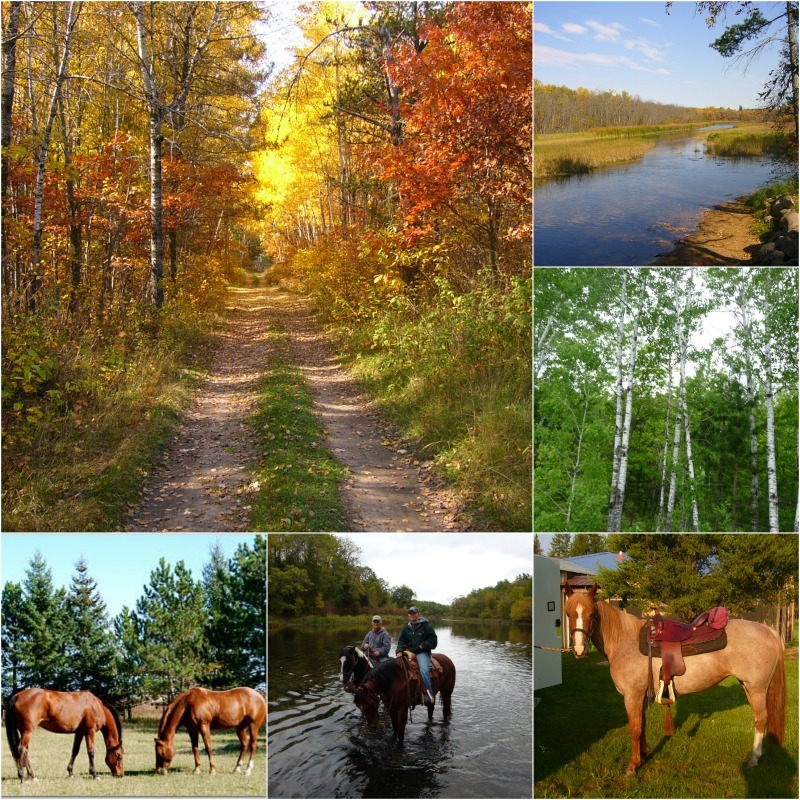 There are over 20 miles of designated Horse Trails in the state forest and additional public use forest roads available for riding. Access to state forest trails are within ½ mile ride of both cabins. We have private trails on 200 acres available to our guests. The Shell River borders Went North with horse friendly river access to the east in the state forest. Shell River runs into the Crow Wing River adding to the beauty of Huntersville Forest. The area consists of sandy soils that offer excellent footing for horses in all types of weather. Park Rapids is within 15 miles driving distance and offers many choices for shopping or restaurants. The area offers many other options for entertainment to our guests. Please check out the link section for ideas. No Dogs are allowed in either of our cabins. Imagine ... a long weekend way from the distractions of your daily routine, quality time spent with your horse riding in pristine wilderness trails, and comfortable accommodations for both human and equine. This is what we experienced when we ventured to Went North. Tami Wenthold, experienced horsewoman and property owner, offered a warm welcome and answered our questions. Our only regret was that our time passed all too quickly.